One teen is dead and two others seriously injured after a police chase and crash on Milwaukee’s south side. 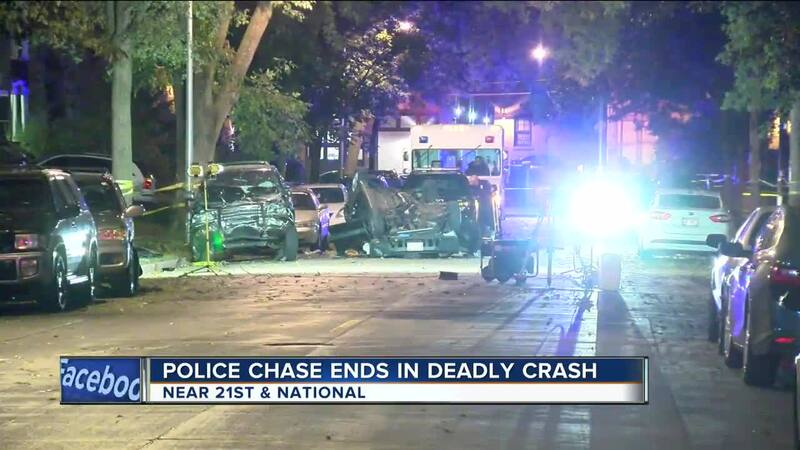 MILWAUKEE – A police pursuit ended in a deadly crash and seriously injured two others Tuesday night on Milwaukee's south side near 21st and National. The deadly police pursuit started around 11:30 Tuesday night when officers tried to conduct a traffic stop not once, but twice. The 19-year-old driver didn’t stop —he sped off, lost control of the car, crashed into parked cars in the area, and died. Two passengers —a 20-year-old man and 22-year-old woman were seriously injured. Marcel Torres lives nearby and witnessed the crash. “We just heard tires screeching really loud and as soon as I opened the door I heard the boom,” Torres said. That boom resulted in this wreck along with two other cars totaled in its path. John Lane said he came home to his truck of five years destroyed. “When they hit it, it just turned my truck into a ramp. The front end was just smashed all up,” Lane said. Torres fears if this happened at a different time of day children may have also been hurt. “I thought that was the scariest thing because this is a neighborhood full of kids, thousands of kids play around here," Torres said.